June 26 marks the 99th anniversary of the establishment of one of the most powerful armies of the East, Azerbaijan’s Armed Forces. The history of the modern Azerbaijani army dates back to the Azerbaijan Democratic Republic created in the early 20th century. The Armed Forces of the Azerbaijan Republic were created on June 26, 1918 to protect the country from the military aggression of Armenia and Russia. Today, the Azerbaijan’s Armed Forces consist of Air Force and Air Defense Forces, the Navy, and the Land Forces. Currently, the Azerbaijani army is considered the strongest and most modern army in the South Caucasus region. Global Firepower, a think tank providing a unique analytical display of data concerning world military power, ranks Azerbaijan 59th by military strength among 128 countries. The skills and combat readiness of the Azerbaijani army are growing year by year, as the country’s Armed Forces regularly conduct military drills to improve its capabilities. Azerbaijan pays special attention to the professional training of its military personnel. Alongside the exercises inside the country, Azerbaijani Armed Forces participate in various military exercises conducted at the international level, including those with the Turkish, Russian and Georgian armed forces. Over the past few years, Azerbaijan has also succeeded to modernize and strengthen the Caspian fleet inherited from the Soviet time. Today, the Azerbaijani Navy is considered the second, after Russia, strongest fleet in the Caspian Sea for its capabilities. The army building process is of particular importance for Azerbaijan, as twenty percent of the country’s territory – Nagorno-Karabakh and seven adjacent regions – is under Armenian occupation and the country is in a state of war with neighboring Armenia. The Azerbaijani army is able to liberate the occupied lands at any time, and Armenia-triggered April fights last year were a clear evidence of that. During the four days of fighting, the Azerbaijani army liberated several strategic heights and settlements on the frontline, thus making the aggressor Armenian side retreat. Azerbaijan’s military expenditure has developed rapidly in recent years, and in a short time, the military budget has increased by more than 20 times. 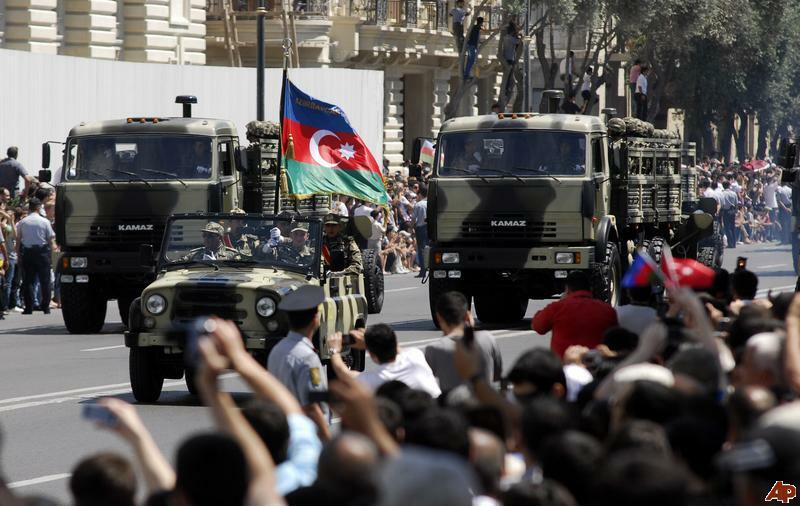 Azerbaijan provides the national army with sufficient military budget every year. Defense spending of Azerbaijan determined in the state budget for 2017 made up 2.64 billion manats ($1.55 billion), which exceeds the spending for 2016. It is noteworthy that Azerbaijan’s military budget exceeds the overall state budget of occupant Armenia by more than $1 billion. The Azerbaijani army possesses modern weapons and technical equipment for maintaining a high level of combat capability. These weapons are both purchased from other countries, such as Turkey, Israel, Russia, the U.S., and also are of domestic production. Currently, twenty-eight military factories are operating within Azerbaijan’s Defense Industry Ministry. The ministry has increased the volume of defense industry products in 2016 by 1.6 times compared to 2015, while the product assortment rose by 1.8 times. Currently, the military factories of Azerbaijan produce sniper rifles, sniper machine guns, mine protected armored vehicles, unmanned aerial vehicles, anti-tank mines, small arms, special reconnaissance patrol vehicles, and many other weapons. Today, the Azerbaijani army’s contribution to international security and stability continues to grow. The Azerbaijani Armed Forces have collaborated with NATO under the Partnership for Peace Program since 1994 and have military cooperation with a number of foreign states. Azerbaijan supports certain peacekeeping operations under the NATO and the UN. Since September 1994, the peacekeeping divisions of the Azerbaijan Armed Forces have served in international peacekeeping efforts forces in Kosovo, Afghanistan and Iraq. Since 1998, Azerbaijan annually celebrates the Day of the Armed Forces on June 26, in accordance with a relevant decree issued by the former President of Azerbaijan Heydar Aliyev. Thanks to the state attention to the military, the Azerbaijani army is currently one of the most skillful armies in the world and the most powerful army in the region.